A delicious dairy and gluten free dessert that is sure to please! For the “cheesecake”: In a medium bowl, combine cashews and water. Let soak until soft, approximately 2-3 hours. Drain and rinse. In a blender, combine soaked cashews, agave nectar, vanilla and almond milk. Blend until smooth; refrigerate. For the soy whipped topping: In a measuring cup or small bowl, dissolve corn starch in soy milk; add agave and vanilla, mix well. Pour soy milk mixture into a blender; set to high. Slowly pour in coconut oil and blend until mixture becomes thickened, approximately 3-4 minutes. 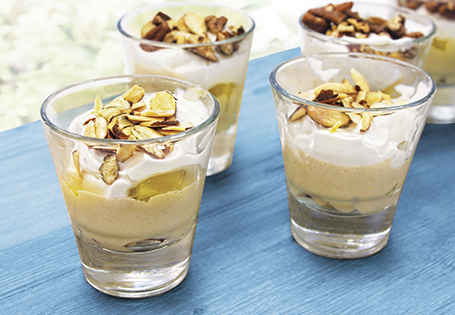 Layer almonds, pineapple, cashew mixture and whipped topping. Freeze at least 30 minutes, garnish with toasted almonds and pineapple chunks.